Right time. Right dress. Right man? The author of The Yummy Mummy returns with a sparkling, hilarious look at what happens when you meet the wrong man at the right time. Two weeks before her wedding, Stevie Jonson, a successful graphic designer in her mid-thirties, has got serious jitters. Is she finally growing up, or compromising horribly? In love or in denial? By the time Stevie steps into her 1930s vintage wedding dress for the last fitting, her life is coming apart at the seams. Her best friend, Lara, is moving to New York City, fulfilling Stevie's long-held dream of moving there herself; her parents' marriage is heading for the rocks; her teenage crush (The One That Got Away) is back in town, a reminder of everything her fiancé isn't; and that niggling little voice in her head is getting louder all the time. As the clock ticks, a shocking secret threatens to bring Stevie's future crashing down around her. 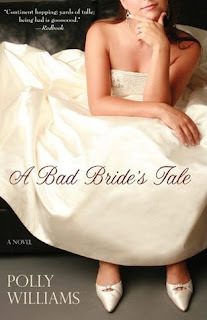 A Bad Bride's Tale is a grown-up love story about marrying, mating, compromising . . . and how love doesn't have a timetable. A Bad Bride's Tale is differentiates itself from other chick lit with more interesting side stories, but you can call the ending a mile away. One thing that really stuck out for me in this book is that people from England fly to New York seemingly at will and very often. I would think international flights would be too expensive for the way they kept hopping the pond. I guess it's a small complaint, but it's one that stretched it's credibility too far for me. On the plus side, A Bad Bride's Tale kept me reading till the end, but on the minus side, I kind of felt like I wasted my time.